The holidays are long gone and it’s time to clean up, guys. I know it’s sad, stressful, and even painful, but once we get it done we can have fun again. Maybe you’ll even think my clean-up tips are fun? 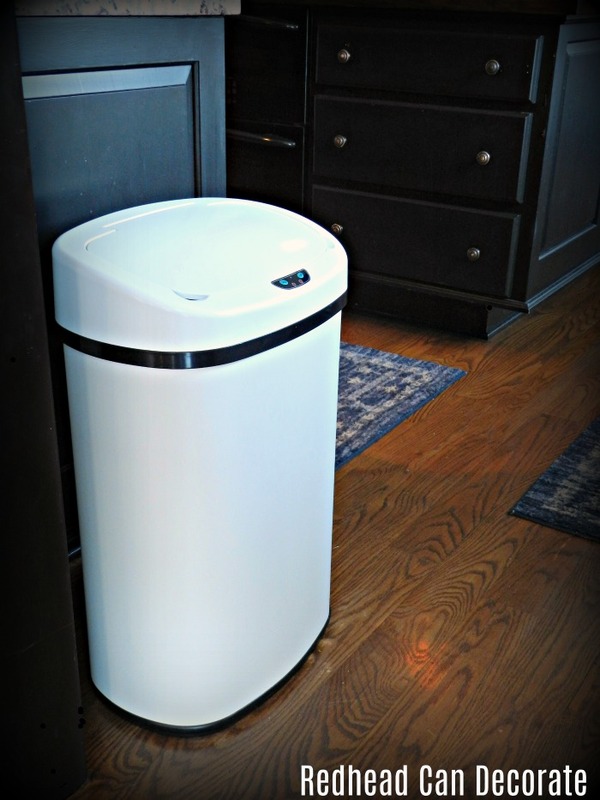 Welcome to my “3 Clever Household Storage Clean-up Tips. I hope you give one a try or know a friend that might use it. Let’s just say I have a very large collection of ribbon, and a crate just won’t cut it. To top it off, my Dad gave me a big box of left over ribbon from his apartment complex. Long story, but it ended up really over flowing my box of ribbon that I have kept in the closet for probably 20 or so years. It’s time it comes out of the closet. 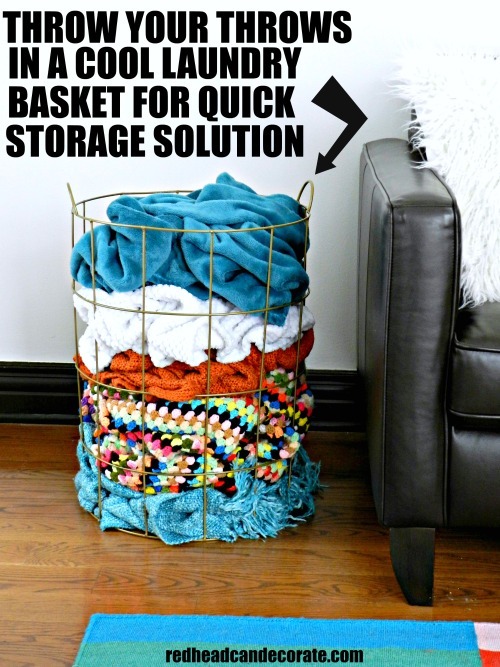 How cool is that laundry basket ribbon storage for ya? (Sylvia loves ribbon, and I actually had to put Forest in time-out.) Not only is this ribbon basket functional, but it’s kind of pretty. It’s perfect size for the amount of ribbon I have and I can thread the ribbon through just like the smart Pinterest people did. I even took it a step further and did it by the season, starting with Christmas first on the left side. Then, I ended it with birthday present curly type ribbon. Now I can store this up in my closet and pull down what thread of ribbon I need. So cool. On to #2 storage clean-up tip…I think you may get a kick out of this one. Picture my husband, 2 teens, and 2 cats sprawled out on our sectional sofa at 11:00pm. Mom comes in and says, “Time for bed!” Everyone is exhausted and cranky, and the last thing they care about want to do is fold the blankets and put them away. Guess who usually does it the next morning after all the other chores I do before work? Yep. Me, Mom. It’s not that big of deal, but still, kind of annoying. So, I came up with this “Throw Storage” idea that I think most folks can do easily. It’s as simple as “throwing” the throws in the basket. Yah, you heard me. Just throw them. Hey, whip them in there if you really want to, I don’t care, just get them in the basket. Boom. Done. Go to bed. I know the first thing you are thinking is that white will show everything, right? I had those very same concerns, but am pleasantly surprised by how this just doesn’t show things like my black or stainless steel ones did. It’s kind of like that with cabinets, too. I notice everything on my black cabinets, but my white cabinets need way less attention and don’t show things. The next thing I think you are curious about is the automated censored part. The reason I love this feature so much is that hands don’t have to touch the lid. Not only is that keeping it cleaner, it’s keeping the germs off of my hands. All you have to do is wave your hand in front of the blue sensor and it opens and stays open until you move away. Then it closes quietly. I can’t imagine a garbage can without this convenient feature now. This is where we ordered it from (fantastic price! ), and it arrived quickly. Well guys, now that I have my ribbon all tucked away I think I will go take a nap on my sofa with one of those throws, and possibly dream about my pretty new garbage can. Okay, that would be silly, but I had to end this post one way or another. Totally me. Lol Now I can just whip them in there, but I hope they do it ? 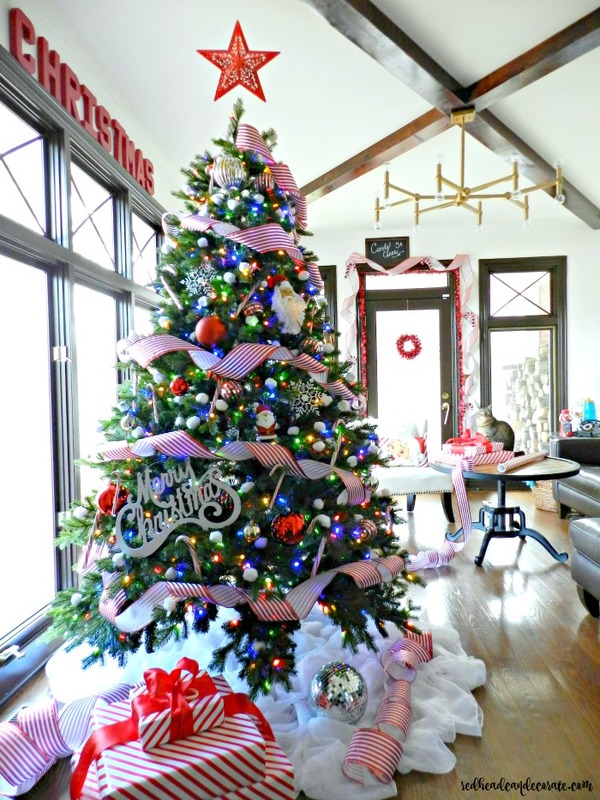 Great idea for the ribbons. When my Mum passed on she had a slew of ribbons in the drawer, so naturally I inherited them. Didn’t know how to store them until I just read your post. I am in the process of doing it now. Thanks for the great ideas. Awww!! So nice, Bette! Do you have as much as me? Did you use a laundry basket? I don’t have as much as you, but I am using a laundry basket. Wow; great ideas! Seems everybody is doing ‘clean up’ after the holidays. I’ve got my Christmas decoration items all put away but I feel SO LAZY and not at all in the mood to clean. Sitting on the laptop now scanning everyone elses nice clean shiny homes, cupboards, floors, etc………….all I want to do is take a nap! Carol, don’t let my posts fool you!!! I am so tired!! The link for the wire throw basket is not there; can you tell me where you got the basket? Love the way it looks and not folding really appeals to me. There isn’t a link, but I mention where I found it in the post. Woman you are so creative and as always you are so funny! Have to admit I’m the same way about the cleaning and organizing after the holidays. I know I’m a little (or maybe a lot) OCD, but I love it when things are clean and organized. Thanks for sharing your awesome ideas. Always look forward to your posts! These are such great ideas. Nice way to keep ribbons organized. I also love the ‘near the sofa’ wire basket to store throws into. It must be a kids/husband thing, because no matter how much I tell mys to please fold their throws after using them, and put them away, they just will not. ??? It’s universal, Ivory! Moms everywhere are doing the same thing we are ? 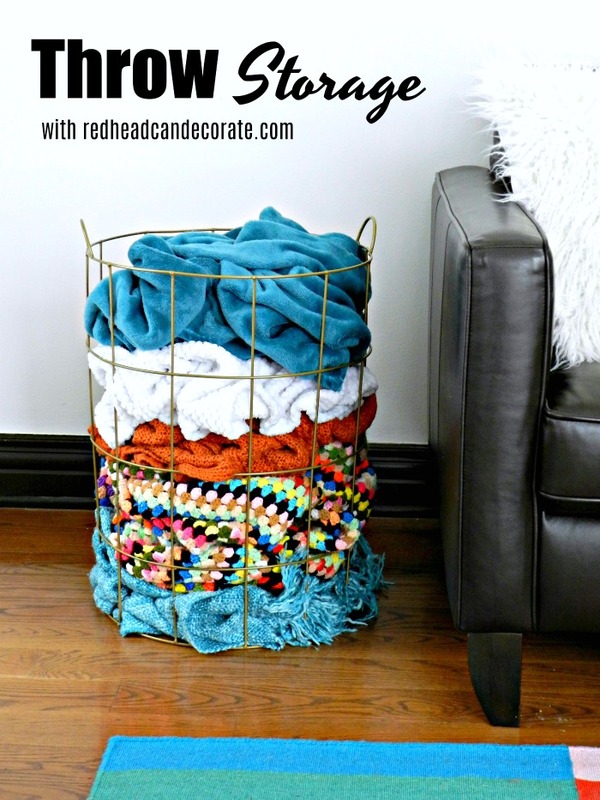 Clever idea on the storing of your throw blankets. In my Christmas / craft / workshop shed, Hubby put up some plastic / vinyl rain cutters for me to store my ribbon. Works like a charm, as I can see and get to the ribbon on what I want right away; all arranged by color. You cut the gutters to length for the wall space that you may have. That wire basket would be a big help for throws except for dog hair, would need to elevate basket somehow off floor, maybe have a cover over bottom. 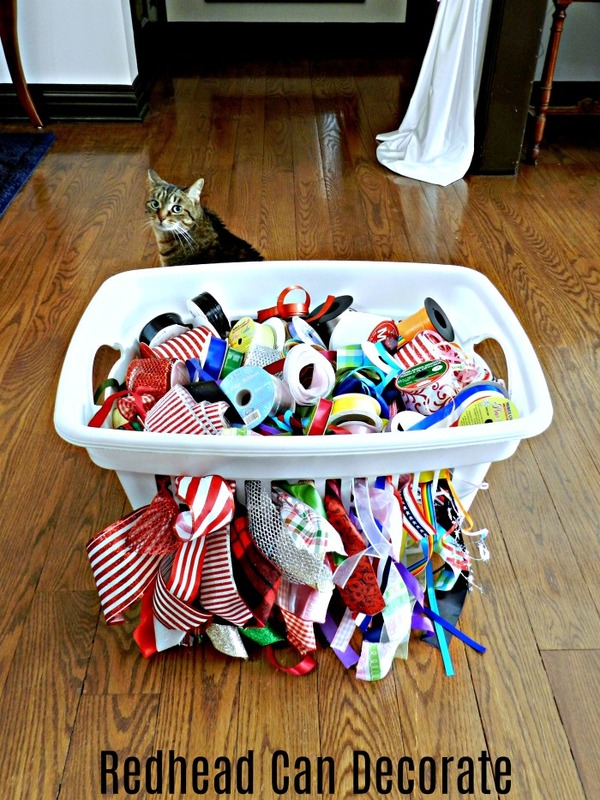 Love your ribbon storage, I’d need a big laundry basket, then figure out where to keep it. Do like your trash can, have to use foot to open ours which am too impatient to use, use hand to open and it’s stainless steel, maybe someday, super idea tho. You keep your home so nice. I do in spurts, depending on what am involved in at the time. Lately have been working on organizing my picture frames, until I need a few or one or two. Not much storage in our house and no garage or basement. Going down to shed in lower yard is an adventure right now with the rain and mud from melting snow. Did buy myself a pair of nice high rain boots finally. I love reading all of your emails and all the interesting projects your are always doing! I’m interested in advice you can give me on painting a french provincial armoire and nightstands I just purchased. I painted my kitchen island with chalk paint and finished it with wax but I’m not sold on this way of finishing furniture. I like that you don’t have to sand the piece before painting but don’t feel the finished product is as durable. Cabinet paint they sell for example at Menards, is durable but very limited in colors. What do you recommend or use, and what kind of prep do you have to do? Thank you! I have a few furniture pieces I recently purchased and would like to repaint. Can you tell me what kind of paint and sealer you have used on your painting projects? I painted my kitchen island with chalk paint and then put wax on it but i’m not sure I feel this is the most durable. I want to get this right the first time because I don’t want to have to redo it down the road! I love getting your emails and seeing all the great ideas you have! Thank you for any help you can give me. Sorry i bothered you again. I didn’t see your January 12th response! 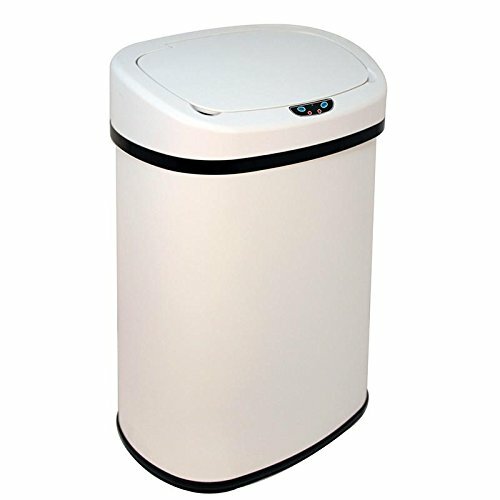 May I ask what size is your new sensor garbage can? Also, I see a lot of the stainless steel finish online but hope to find a black one.